Use with your favorite cleanser, or toner. Use with witch hazel for a natural cleanser. Place in a mesh bag and launder with your regular laundry. These were made from 100% cotton flannel, the same kind of fabric used for your ultra soft and snuggly pyjamas. You know how when you open your mailbox and rip open that package, the products don’t usually turn out as nice in real life as they were depicted in the photos? No such problems here. In fact, the cotton rounds surprised me with how vibrant and pretty they were! I think I did a little *squee* when I saw such cuteness. These are soft to touch, and so luxurious on my face. I’ve washed them over and over again for the past year, and they are still going strong. The fabric still hasn’t shrunk, nor did the designs fade. The owner, Sheila, was really wonderful to work with. She answered my convos quickly, and her prices were extremely reasonable. Shipping was super fast as well and everything was packaged properly. Most importantly, the stuff that were in my hands looked exactly like they did in the photos, if not nicer. One thing to note though, is that I do not use these for removing makeup. What, dirty these adorable things?! I absolutely refused to stain them with the remnants of my waterproof mascara, dark-coloured eyeshadow or hot pink blush, noooo way. Therefore, I only use these to apply toner. After wiping down my face and neck with toner, I throw these into a little mesh bag, and dump the mesh bag into the washing machine on laundry day. When the load is done, I shake up the mesh bag a bit to separate the rounds and hang the entire mesh bag up to dry. Easy-peasy! 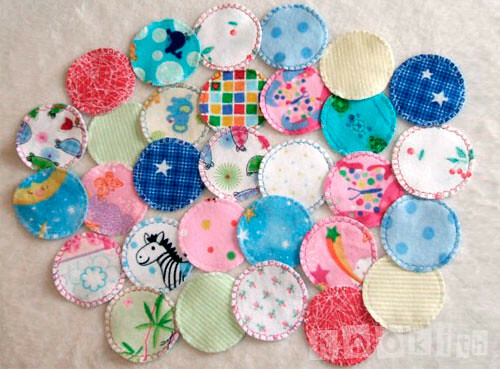 Have you ever stopped to think how many pieces of disposable cotton thingys you use in a day? In the past, I used 1 in the morning and 1 in the evening for toner, and 1 to remove my waterproof mascara. That was 3 pieces in a day, and 21 pieces in a week. I am now using the disposable rounds only for days when I’m wearing waterproof mascara, as I remove non-waterproof mascara with my fingers and some cleansing oil. I’ve reduced the usage of the disposable rounds to less than 7 pieces a week. Isn’t there enough rubbish in the world already? Why fill up the landfills with disposable cotton rounds when you can use these and save the earth? I would definitely buy from Sheila again, though I doubt it’ll be anytime soon, because these are so durable that I’m beginning to think it’ll be years before I’ll need to replace them! Yeah she has really cute fabrics, and they are really cheap too! Those are super cute. I would have never thought these existed. I’m surprised you’ve never seen them before, because I know you stalk etsy very often :P! If you do a search using the keywords “cotton rounds” or even “facial cotton”, there are plenty of listings. They ARE cute! I want some of these now! Yeah they are super adorable 😀 If you sew, you could probably do them yourself. There are listings on etsy for these cotton things, but many of them are knitted/crocheted, and I prefer cotton flannel because in my experience, those don’t feel as soft as cotton flannel, especially on my face.